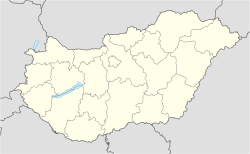 Záhony (Ukrainian: Загонь) is a town in Szabolcs-Szatmár-Bereg county, in the Northern Great Plain region of eastern Hungary. It covers an area of 6.97 km2 (3 sq mi) and has a population of 4675 people (2005). It is near the Ukrainian border (at Chop and Solomonovo) and was part of Ung county before Trianon Treaty. Road and railway border crossings into Ukraine are located here. The Ukrainian town across the border is Chop. The Tysa bridge at the Chop-Záhony checkpoint (view from the Ukrainian side). Wikimedia Commons has media related to Záhony. This page was last edited on 16 February 2019, at 01:09 (UTC).